In South Carolina, which barely escaped the brunt of Hurricane Irma last summer, municipal stormwater managers are demonstrating that there is no “one-size-fits-all” solution to limit runoff pollution. And as the risks of poorly conceived stormwater management plans heighten with more frequent and more intense precipitation, the state’s big cities and beach towns are taking it upon themselves to develop a diverse set of new regulations and infrastructure projects. Federal regulations on stormwater discharge in the U.S. have evolved in recent years to ensure a basic level of protection for the nation’s most vulnerable waterways. 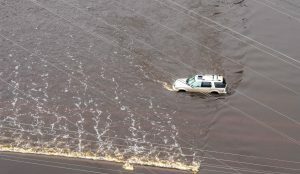 But federal regulations – and even those developed by individual states – fail to account for the unique stormwater management challenges faced by specific municipalities. In 2011, the City of Charleston broke ground on the most expensive drainage project in the city’s history. By 2021, the $154 million project is expected to build a new underground conveyance system consisting of pipes measuring 3.6 m (12 ft) in diameter. These pipes will gather stormwater from the city’s northern peninsula, which has been plagued by chronic flooding for decades, before sending it 42.6 m (140 ft) underground for treatment and into a new pumping station. Project planners expect that station to discharge about 605,665 L/min (160,000 gal/min) of treated stormwater into the Ashley River during heavy storms, according to a document from the City of Charleston Department of Public Service (DPS). Planners worked alongside state and federal partners to secure funding for the project with minimal effect on Charleston ratepayers. According to the DPS website, the first phase of the project was fully funded through a grant from the U.S. Department of Transportation. The second phase, currently underway, is using funds from a 2012 50–50 Federal Match program between the federal government and the South Carolina Department of Transportation. City ratepayers will only be partially responsible for subsidizing remaining project phases, with additional aid secured from the State Infrastructure Bank. Columbia, the state capital, is taking a different approach to prevent flooding. Like many other U.S. cities, Columbia assesses a monthly stormwater fee for ratepayers based on the amount of impervious space on each property. But rather than fundraising toward a singular “catch-all” drainage improvement, by 2021, Columbia hopes to build 23 smaller, decentralized stormwater projects estimated to cost about $93 million in total. To complete these projects quickly, last year the city increased monthly stormwater charges for all customers by about $5, and put in place a measure that will further increase that rate by about $1 each year through 2021. For multifamily residences, businesses, and industrial customers that rate multiplies for every 229 m2 (2464 ft2) of impervious space on the property. By building green infrastructure measures, eliminating impervious space, and educating the public about sustainable stormwater management, these public-facing customers can reduce their utility bills by up to 30%. Along South Carolina’s coast, stormwater management is intertwined with tourism, a main driver of the region’s economy. When Myrtle Beach was developed in the early 1900s, stormwater from streets was conveyed through drainage pipes and deposited, untreated, directly onto the beachfront. Most of these pipes still stand today, sending pollution into the Atlantic Ocean. After heavy rainstorms, the resort-town routinely issues advisories recommending that beachgoers swim at least 61 m (200 ft) away from the discharge and keep their heads above water at all times. Since 2002, Myrtle Beach has been working to replace 50 of its stormwater drainage pipes with outfalls. The new outfalls will send stormwater underground for treatment and release it into the ocean about 366 m (1200 ft) from the shore where it can dissipate rapidly. This upgraded system cuts health hazards to swimmers and greatly reduces flood risks along the city’s main thoroughfares. However, the proposition is expensive. The project was denied federal grant funding and relies on a small rate-paying population. 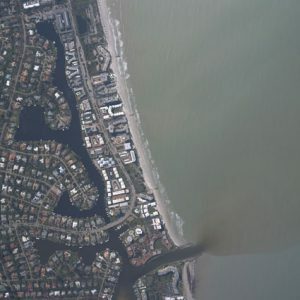 The city expects the 12 new outfalls to take 35 additional years to fund and construct, with a remaining price tag of nearly $150 million, according to Myrtle Beach Online. Just 32 km (20 mi) down the coast, the resort town of Pawleys Island is reaping the benefits of a history of proactive stormwater management planning. After Hurricane Hugo caused extensive damage to town buildings in 1989, the municipality took steps against impervious space. In 2007, Pawleys Island adopted rules that formally limited the amount of impervious ground cover allowed for new developments and renovations to 40% of the property. It also prohibited impervious driveways, requiring residents to use permeable pavers or other substitutes that allow stormwater to leach into the ground. Like its larger neighbors, Pawleys Island also charges its few year-round ratepayers a stormwater fee based on impervious ground cover. Since implementing the rules, Pawleys Island has yet to experience the recurring stormwater buildup that troubles most of the state’s larger municipalities. When then-tropical storm Irma grazed South Carolina late last summer, coastal towns like Myrtle Beach experienced extensive street flooding and building damage that carried a hefty price tag for clean-up. In Pawleys Island, however, the same storm damaged only sand dunes, according to the Charleston Post and Courier. As examples in South Carolina demonstrate, effective stormwater control relies on effective policy. While state and federal stormwater regulations may establish a sound baseline for runoff prevention, municipalities should consider a bottom-up approach that considers their unique geography, population, and needs to achieve lasting results.